*The Z’nox: The Z’nox are a race of reptilian aliens. 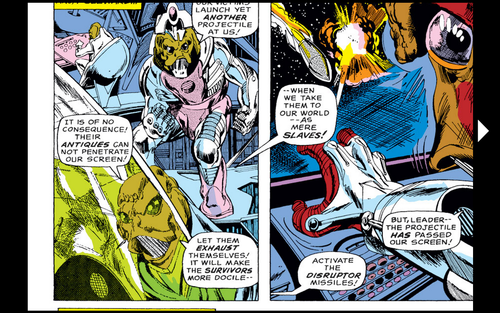 They are very minor aliens in the Marvel Universe and rarely come back. The issue begins with the X-Men returning from their most recent mission and being greeted by Polaris and Havok in full uniform. 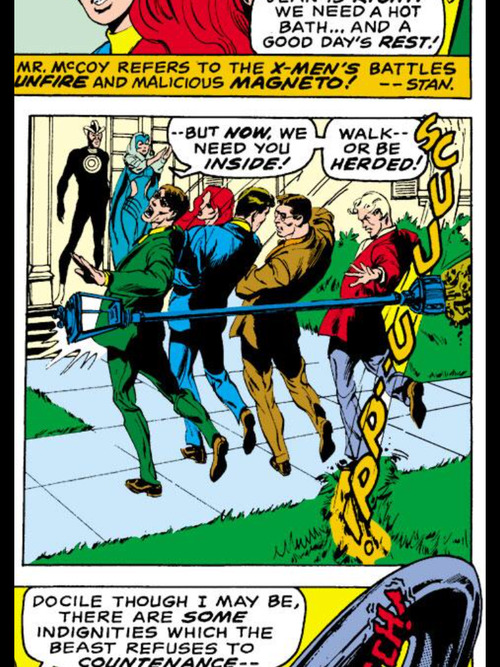 Polaris and Havok tell the X-Men that they need to come inside immediately because the Earth is in danger, but the X-Men don’t believe them. 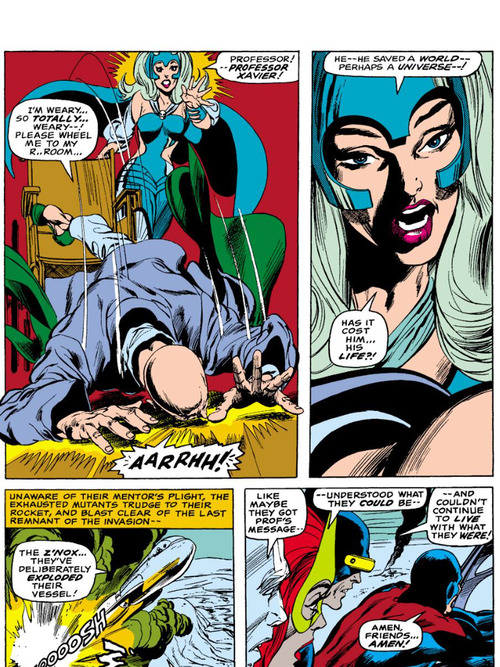 A fight breaks out between the two groups before the original X-Men agree to listen to what Lorna and Alex have to say. Havok explains to the X-Men that an alien race called the Z’nox are planning on invading the Earth, but the X-Men still don’t believe him. 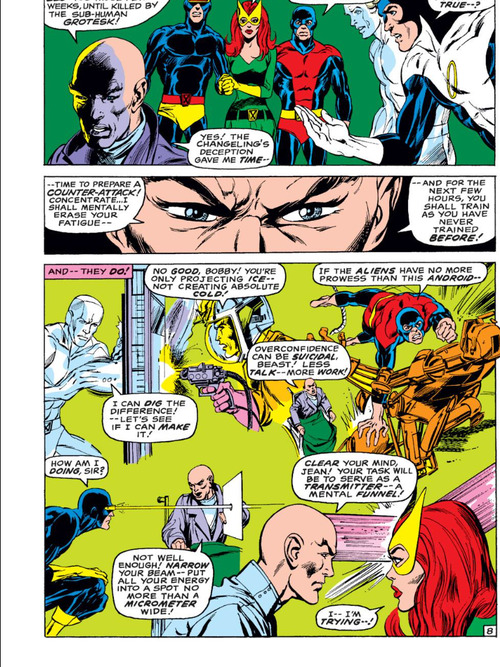 However the X-Men come to their senses when it is revealed that Professor X is alive! 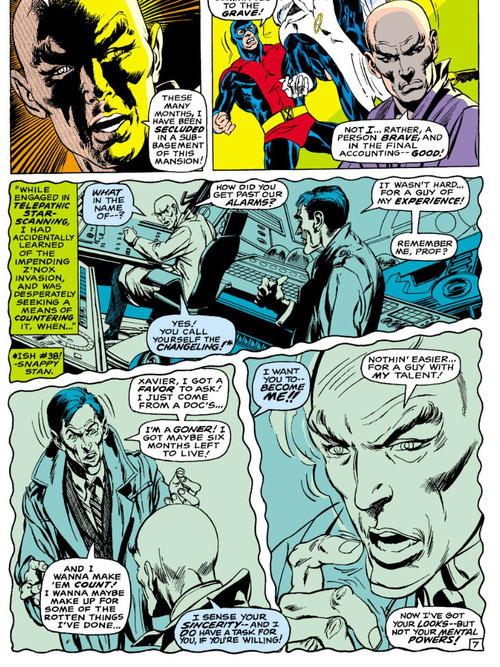 It is revealed that Professor X needed time to plan a counter to the upcoming Z’nox invasion so he faked his own death with the help of Changeling. During the past months, Professor X has prepared for this alien invasion and he now thinks he is prepared to defeat the Z’nox. The Professor then trains with the X-Men in preparation for the upcoming attack. When the Z’nox reach Earth, the X-Men board their ship and attack the aliens. The X-Men are fighting valiantly but are losing. To turn the tides, Professor X launches into his grand plan. Professor X reaches out to all of the kindred minds of Earth and links minds with everyone that he can. 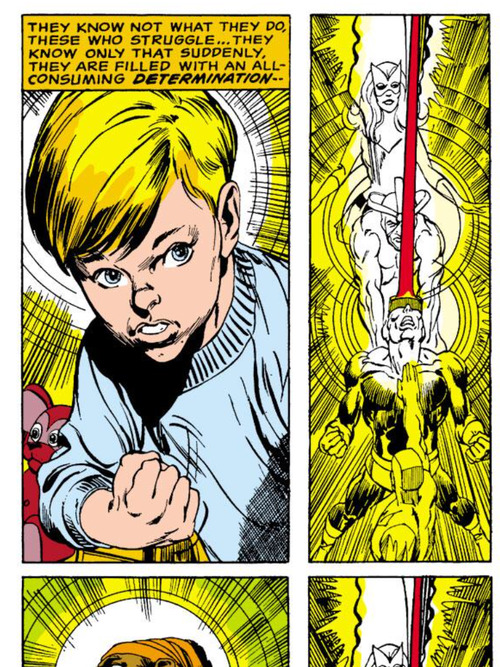 He then sends the mental energy from Earth to Jean, who sends them to Alex who boosts the mental energy with his cosmic rays, who shoots the rays at Cyclops who transfers the energy into his eye beams. 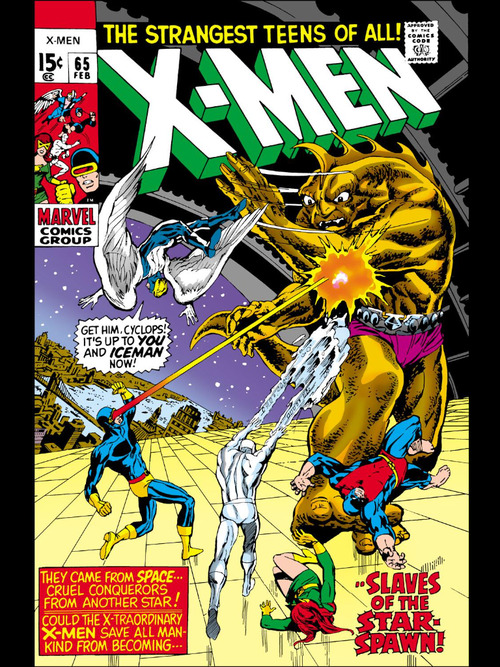 While this is happening Iceman shoots ice beams at Cyclops so that he does not overheat. The Z’nox then begin to feel extreme mental pain. Fearing defeat, the aliens defeat. However Professor X collapses into a coma after the victory is one because he overexerts himself. This issue had some major problems, but it was still pretty great. Even though it was absolutely ludicrous, I really enjoyed when the X-Men combined their powers together to stop the Z’nox. 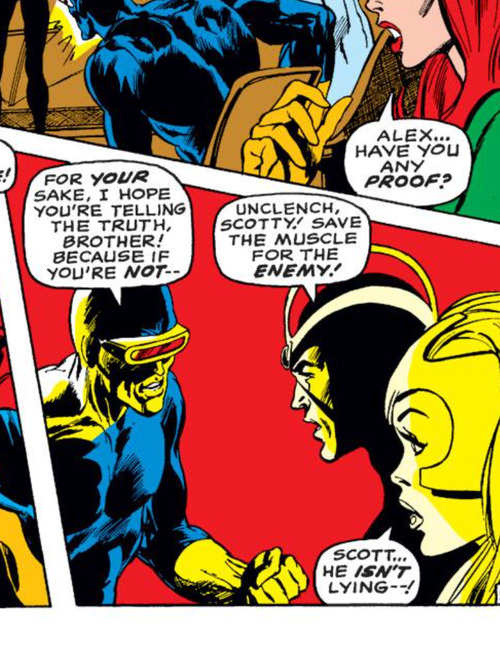 It was one of the few times in the Silver Age when the X-Men acted like a team and combined forces to defeat a foe. 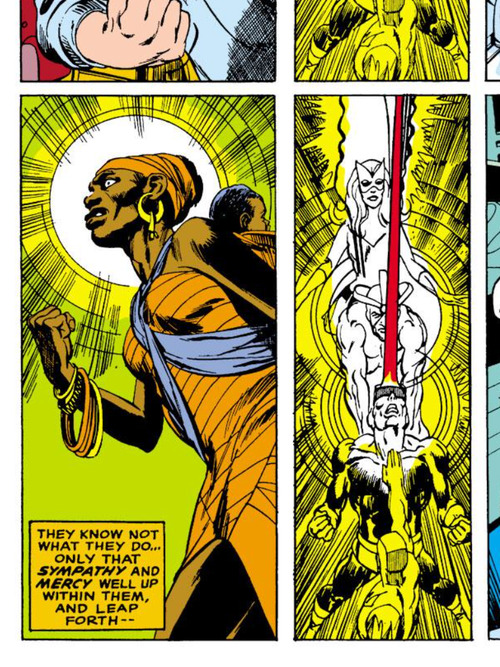 I also really loved that the people of Earth were helping the X-Men out with their mental energy. The panels with ordinary people were really great. That being said, there are some major problems with this issue. 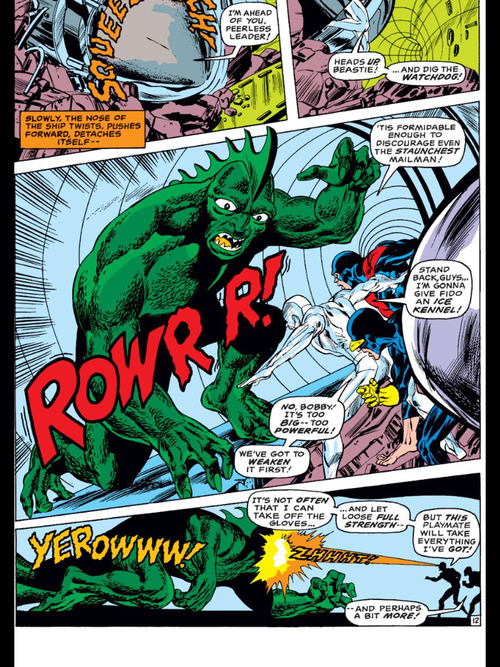 First off, this issue definitely has the most unreasonable hero fight that I’ve ever seen. Why on Earth do the X-Men distrust Polaris and Havok? Why would they lie about an alien invasion? 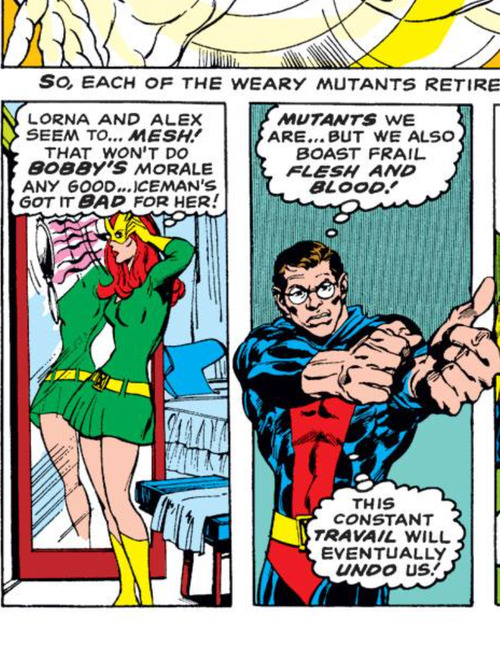 I understand that Iceman is jealous of Havok, but I don’t understand why the rest of the team is so distrustful. My second major problem is that Beast looks terrible in this issue. I’m a fan of Neal Adams’ art in general, but he is horrible at drawing faces sometimes. 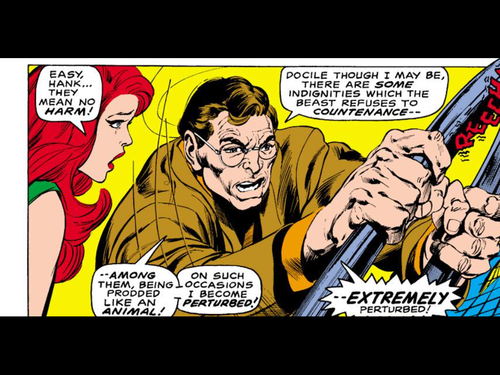 Beast’s face was jarringly bad in this issue. He looks like a middle aged man. My third major problem with this issue is Professor X’s resurrection. I’m glad to see Professor X return, but his reasons for faking his death are stupid. Why couldn’t he plan for this invasion with the help of the X-Men? There was no reason for Charles to mess with his students’ emotions the way that he did. My final big problem with this issue are that the Z’nox are lame. They are a really boring alien race with no personality. They don’t seem so powerful that Professor X needed to fake his death to stop them. Along with the major problems with this issue that I have I also have one small problem and that is the melodrama surrounding Professor X’s potential death. He just came back from the dead! Why make him die again? The reader obviously knows he’s going to live so his coma is pointless. However I have come to expect this melodrama from the X-Men so it doesn’t phase me too much. Overall I was torn about how to rate this issue. I absolutely love the second half of this issue, but I hated the first half o the issue. In the end, I decided to give it 3 out of 5 stars. This issue is great, but there are too many things wrong with it to give it a higher rating. 1. 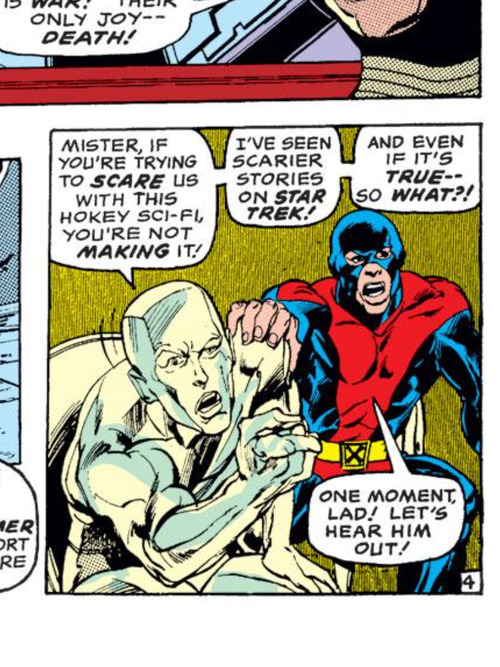 Iceman references Star Trek! 2. 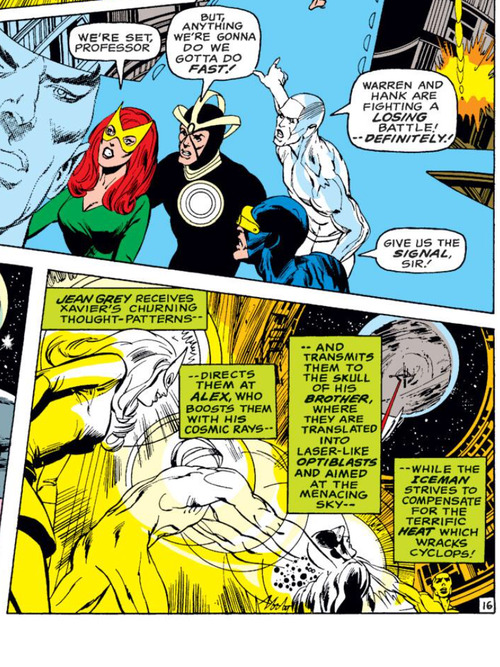 I really enjoyed these panels of the X-Men contemplating what Havok and Polaris are talking about. 3. I have a new url for my blog! This blog is now at www.kevinreviewsuncannyxmen.com ! 4. 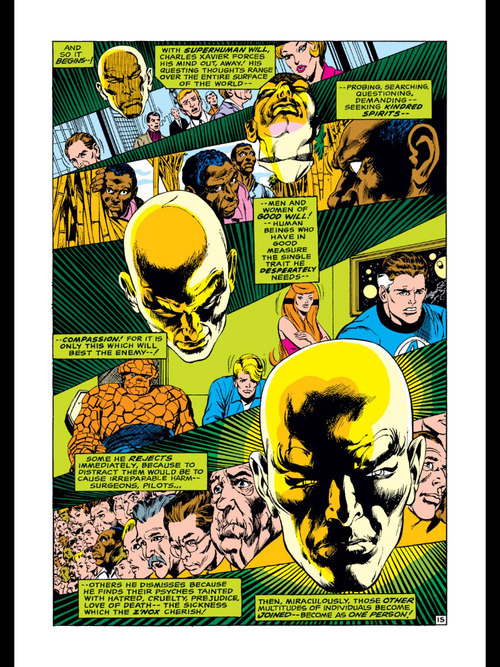 I loved the shout out to the Fantastic Four in this issue. I was less impressed than you were. This felt like the sort of thing that belonged in Avengers or Fantastic Four. 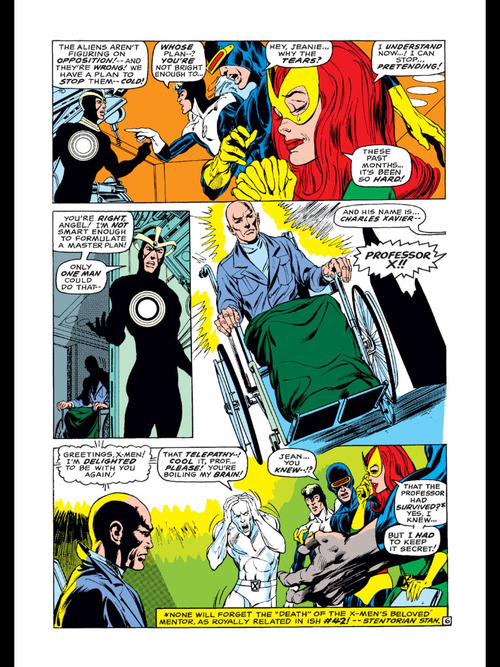 Xavier’s faked death was absurd, and Jean having known all along is contradicted by her own thought bubbles from earlier issues. 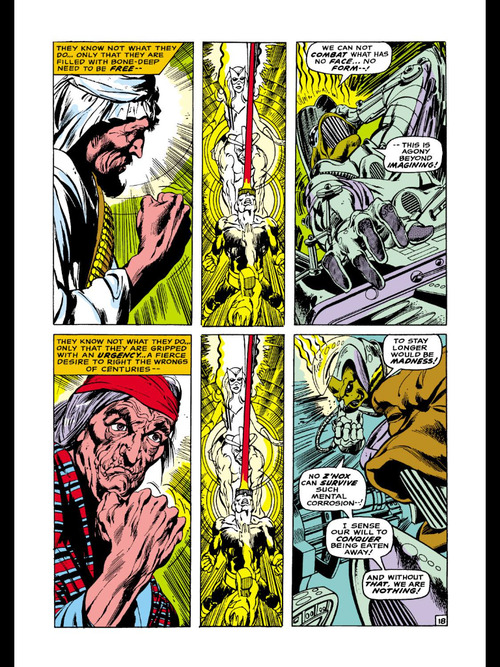 O’Neil also makes a bit of an error – the X-Men are a the South Pole, but Xavier sends his mental energy to Death Valley. And while the art would be great coming from anyone else, it felt really mediocre coming from Adams. This was just not a particularly good issue. Yeah I’m not exactly sure why, but even though there are major flaws in this issue I don’t hate it. The mind linking thing was really cheesy, but it is the kind of cheesy I sometimes enjoy in comics. You are very right about Jean though. There was no evidence of Jean knowing about Xavier being alive before this issue. Really? Wasn’t there something last issue about having a secret, or a burden? I may be reading into it because I knew Marvel Girl knew Professor X faked his death even if she didn’t know she knew. Here’s where a Shatner or someone else might say, “it’s just a story!” But we’re fans, and to us, it can’t be just a story! Any lapse in believability or inconsistency hurts our ability to suspend disbelief and think it’s a real world that our imaginations can live in! The fight between Alex and Lorna vs. the other X-Men does seem absurd. After all, they are a team and lots of weird stuff has happened to them. Why wouldn’t they believe their teammates? Also, this issue is yet another example of why I just can’t believe that Professor X’s current death will be permanent. He always comes back/wasn’t really dead in the first place. (I’ve really been enjoying Rachel’s jokes on the podcast about how Prof X fakes his own death all the time.) With Logan’s upcoming death this month, I would like to see him and Prof X meet up in the afterlife. That would be cool and hilarious. 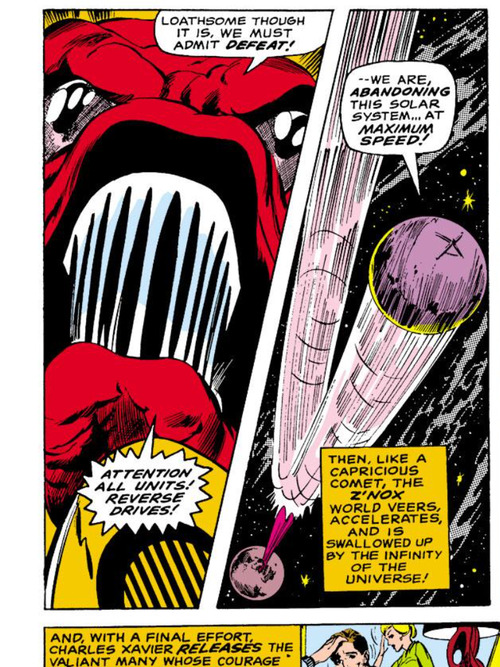 Yeah it seems to be a recurring theme in Silver Age X-Men that good guys always fight each other for bizarre reasons. Yeah Professor X will totally be back in a few years tops. Haha and that would be awesome and hilarious!